This beautiful box includes a red velvet lining with an insert ribbon that you can tie CD’s too, or other treasures like rings or bracelets. The overall size is 6-3/4 x 6-3/4 x 4″ high so it’s higher than most of their boxes. 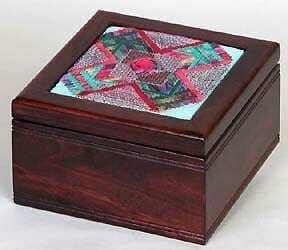 The design area is 5″ square and there is no glass so your needlepoint will be able to really shine. It’s perfect if you do any kind of stitches that stand up high such as stumpwork! This has a rich mahogany finish.